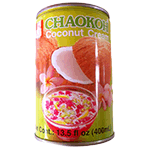 Coconut milk and cream are used both separately and together in curries and spicy soups to 'cool' the heat of the dish. They're also delicious in sweets such as coconut rice pudding or coconut ice cream. Product of Thailand.